The seminars considered such questions as how responsive should policing be to community priorities and concerns? Can and should the police solve more crime? 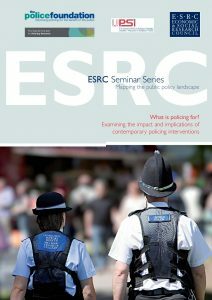 What role can policing play in securing economic and social well-being? A publication based on the presentations by speakers and other contributors at these seminars entitled was published in 2009 by the ESRC.